Sadly, this particular image is not one I can claim ownership of. My Snaab and I managed to escape. Good thing the Wicked Witch of the West Wing is here to console us all... nevermind the fact that she was already scheduled to be in MPLS today well before the bridge collapsed. I feel special. 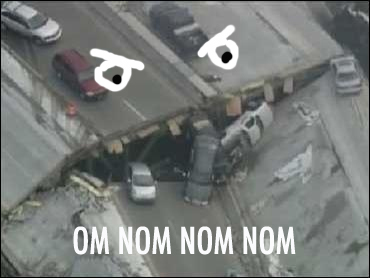 By the way, I love how Bush is all about giving us federal funding now that the bridge is actually down. I guess the administration would rather clean up the mess than prevent it in the first place.